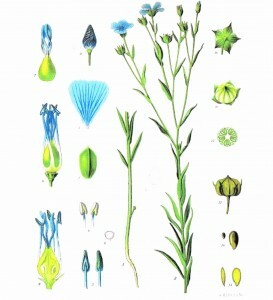 Linen is woven from the Flax plant (Linum Usitatissimum). It is one of the oldest and loveliest textiles known to man. It dates back over 5,000 years and was used by the Egyptians. The plant is grown in deep loamy soil and is one of the few plants to have a “true blue” coloured flower. Flax is environmentally friendly. It needs only a short growing period, very little fertiliser and the whole plant is used. The seeds produce Linseed oil, which is used in painting, French Polish and varnishing. Seeds are edible as flaxseed which is a good source of omega 3. Cold pressed oil is suitable for human consumption. Flax was planted all over Ireland, north and south and since the Linen Board was set up in 1711 offering prizes to manufacturers of linen, we can assume that our history with linen goes back much further than this. The Irish Linen Board, published a list of nearly 60,000 individuals who were growing flax in 1796 in Ireland. Spinning wheels were awarded based on the number of acres planted for example; one acre awarded the planter a spinning wheel, while five acres awarded him a loom. Fabric is made from inside the stem or stalk of the plant and it is from this that it gets its distinctive texture and beautiful quality. A great friend of our family remembers his grandfather removing the outer stalk of the flax to expose the fibre inside. This was done by hand then, and was very hard work. Jute tape, rope, sacking, and paper are also produced from this fine plant. Linen is made from natural fibres. It is very beautiful, hard wearing should last for many years and can be passed on from one generation to the next. it may have what looks like small imperfections which may be a change in the weave this is normal.